Due to their commitments to Solo, from which they were unceremoniously ejected, Lord & Miller were unable to direct Into the Spider-Verse, although their fingerprints are all over it. (Lord co-wrote the screenplay and both are listed as producers.) Directing duties were filled by the trio of Bob Persichetti, Peter Ramsey, and Rodney Rothman. Persichetti and Ramsey have big-screen experience as animators, with Ramsey directing Rise of the Guardians in 2012. Among various other gigs, Rothman was the head writer for David Letterman's late night TV show from 1998-2000. He was also a co-writer on 22 Jump Street, which Lord & Miller directed. Into the Spider-Verse continues the trend of expanding the superhero envelope - a necessary progression to keep the genre from becoming stale. Although there have been numerous direct-to-video animated superhero movies (more DC than Marvel) over the years, Into the Spider-Verse is the first example of a traditional comic book character getting A-list animated treatment in terms of its production budget, cast & crew, and marketing. Columbia/Marvel isn't treating this as a holiday cookie; if successful, it will open another path for superhero movies. There's an irony to this, however - at a time when Disney is working so hard to create live-action venues for their most beloved characters, Marvel/DC may be moving in the opposite direction. The move is a blast and, by using a plot device that causes a rift between different dimensions/universes, Into the Spider-Verse has been given an incredible amount of latitude in terms of characters and style. The animation is mostly "clean," meaning that it's not as rich and intricately detailed as the average Disney/Pixar release, but it looks like there was money invested in it (except, of course, for the end-of-credits Easter egg, which...well, that would be spoiling it). There are instances of blurriness, especially in certain background scenes but I couldn't determine whether these are a stylistic choice by the filmmakers or whether parts of the print I was watching were in supposed to be in 3-D. (No glasses were provided.) The use of Spider-Man comic book covers and inside pages is a nice touch and flow seamlessly into the movie's dynamic approach. The plot is minimal, as befits an "origin" story of sorts. 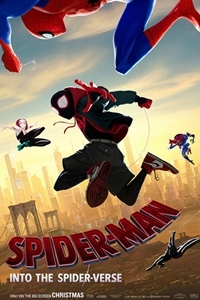 The early scenes are devoted to introducing Miles Morales (Shameik Moore), the boy destined to replace Peter Parker (Chris Pine) under the mask. We meet Miles' family, get to know a little about his circumstances, and see him get bitten by a radioactive spider. Later, he has a brief encounter with Spider-Man in less-than-ideal circumstances. Spidey's luck runs out; he's on the losing end of a fight with Kingpin (Liev Schreiber) and succumbs to mortality, but not before he can pass on a vital "key" to Miles - the way to shut down a supercollider Kingpin intends to use to merge universes with potentially disastrous results. With dimensions overlapping, Miles is joined by a number of unexpected "Spider" allies. Gwen Stacey a.k.a. "Spider-Woman" (Hailee Steinfeld) is a little older and a lot more experienced than Miles. Another Peter Parker (Jake Johnson) - this one past his prime, down-on-his-luck, and still carrying a torch for his estranged wife, Mary Jane (Zoe Kravitz) - crosses over. The Dark Knight-inspired "Noir Spider-Man" (Nicolas Cage) only does black-and-white...unless he's playing with a Rubik's Cube. Peni Parker (Kimiko Glenn) is an anime refugee, complete with wide eyes and a pet robot. Then there's Spider-Ham (John Mulaney), who bears more than a passing resemblance to a certain Warner Brother pig (and even uses his signature phrase - although someone wonders whether he can do that legally). The possibilities with all these characters are, if not endless, at least large, and the filmmakers soften the blow of Peter's death by having another variation of the original Spider-Man (in costume) around for most of the movie. Aunt May makes an appearance - as voiced by Lily Tomlin, she's closer to a traditional version of the character than the Hot Aunt May (TM) introduced in the most recent live action Spider-Man movies. In addition to Kingpin, the rogues' gallery includes a female Doc Ock (Kathryn Hahn) and a supersized Green Goblin. Like Deadpool, Into the Spider-Verse begs the question of whether it's a straightforward comedy, an action film with a strong comedic overtones, or something just really unconventional. Of course, coming after a couple of Deadpools, the strangeness is less bizarre, although it hasn't yet become commonplace. I'm not sure I'd want every superhero movie to be chock-full of jokes, self-referential satire, and cracks in the fourth wall. It works here, as it did in The Lego Movie (and to a lesser extent, Batman Lego) because the unreality of animation allows the filmmakers greater latitude than would be possible in a live action adventure. I'll allow someone with a strong recent understanding of the Spider-Man comic franchise to put Into the Spider-Verse into that context. (Sadly, my familiarity with the book ended about 35 years ago, so I'm out of date.) As a stand-alone movie, however, it's great fun and does enough to satisfy those to whom continuity and canon are important. As a family-appropriate holiday destination, it's more rambunctious and energetic than the old-fashioned musical Mary Poppins Returns and, as a result, may appeal more to today's generation of youngsters. Into the Spider-Verse is a fresh and breezy way to steer the superhero genre and a testimony to the main character's appeal and versatility.